Baltimore Orioles utility infielder Ryan “Flash” Flaherty, who hasn’t pitched since high school, pitches the 9th in the Orioles painful 12-2 loss to the Houston Astros on Saturday. 13,000 people have watched this YouTube video about how to draw maracas. This is what people do. Not bragging, but I drew that. Aww … Cute as kittens! The cicadas are maraca-ing, so it must be time for the annual, “My team picked a fine time to swan-dive out of the playoffs” discussion. Every spring, teams and managers will tell you that the games won or lost in April count the same as, and are as important as, the games won or lost in July … or August … or … you get the gist. Mathematically, I guess this is true. Hooey. The games in April might weigh the same, but they don’t count the same. Because look at it this way. Say you’re the Baltimore Orioles and it’s April and you get swept ugly by the Red Sox at home and then get pounded – mercilessly pounded – by the Astros. You have an entire season – some 140 or more games ahead of you – to make things right. More than 100 chances to fix the unholy, childish mess you made with tinny, disappointing pitchers who can’t find the strike zone and lumberjack-armed batters who can, but often swing through it with gale-force abandon. Because when you lose those games in August, like the Orioles just did this week, there’s not much time — and not many games — left to fix things. Last night, in their blowout loss to the Astros (their second blowout loss in two days), the Orioles put their utility infielder Ryan Flaherty in to pitch the ninth inning. He told reporters he hadn’t pitched since high school. “Wasn’t very good in high school. Still not,” Flash said after the game. This move was simply to rest a bullpen that has been overworked and as shaky as … well, a pair of unhappy maracas. Fun Fact: Orioles ace starter Chris Tillman gave up 6 earned runs in two innings last night. That’s a game ERA of 27.00. Flaherty, who hasn’t pitched since high school (and, remember, he wasn’t very good even then), gave up 2 runs in one inning. His ERA is 18.00. See. Numbers can make your head hurt. The Orioles are 2.5 games out of first in the AL East. They are currently one game up on frisky, surging Seattle for the second wild card spot. Dear Orioles, you have 40 games to fix this mess. This entry was posted in Baltimore Orioles, Baseball and tagged Baltimore Orioles, cicadas, maracas by Jackie, The Baseball Bloggess. Bookmark the permalink. I shouldn’t like this, but…it’s true. This may be the “summer swoon.” Not always annual, but lately, pretty darn close. I haven’t given up hope yet … and I know you haven’t either. Joey Rickard was the key to the season? C’mon! Even Stevie Wonder can see that it’s the pitching! Has been, will continue to be. Granted, that group of free swingers in the lineup tends to run hot and cold from series to series (even game to game), but the pitching has been a mess lately. No, I haven’t given up hope, but the team needs to get all the parts working in sync or they’ll be home in October. At least they are still in the mix, so they can come out of it. But it better start soon. Cicadas…haven’t heard them in years. Could have gone decades to not hear that!! I feel your pain..Rockies lost a bunch of key players and our sudden shot at taking first place and staying there was history. We get some bright moments but late in the game hitting is like passing a hot potato…not me, I did it last night. Pitching…does it ever click right? Cause I forget, been too long! Thanks for the monkies! Bubblegum music at its best! Oh, I LOVE the sound of the cicadas! Just buzzing and drumming and making that weird echo-y noise that sounds like a spaceship. Only the males “sing” — it’s a mating call — and they have to flex their abs to vibrate and create the sound, which sounds like a pretty good workout! 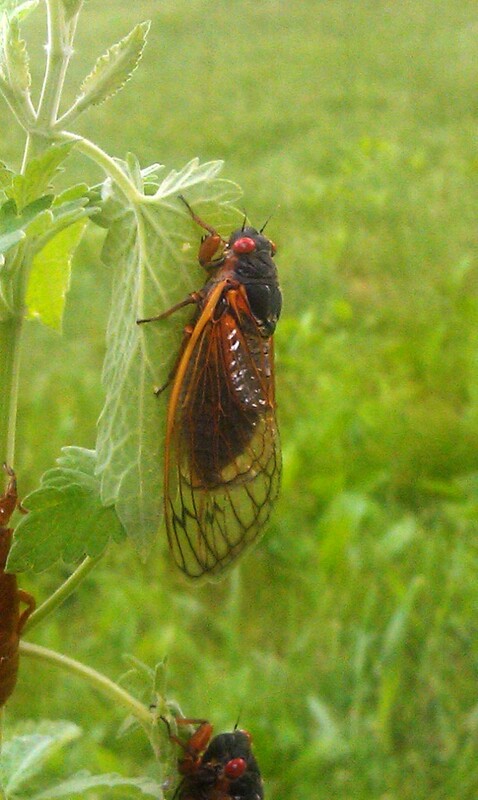 I had never heard a cicada until I moved to Virginia. yes…forgot Davy Jones did that! Keep telling yourself there’s still time left in the season to get to the top. As a Cubs fan, that’s pretty much all we do most of the year after year after year….. And had forgotten about the maracas and the Monkees — great ending to the lead-in. Gloria, we’re going to have to get you a television … your Cubs have the best record in all of baseball. They’re 12-1/2 games up on the Cardinals in their division. Anything can happen, of course … that’s why we play all the games and swan-divier things have happened. Still, Cubs look pretty solid. So, time to buy a sweater, because you just might have to spend some chilly October nights at Wrigley. I liked everything about your post, but I especially loved the, “Not to brag, but. . .” Hilarious. I always look forward to reading new stuff from you, and this is one of my faves–I could definitely hear your tone of voice! It could be worse, you could be a Tigers fan! 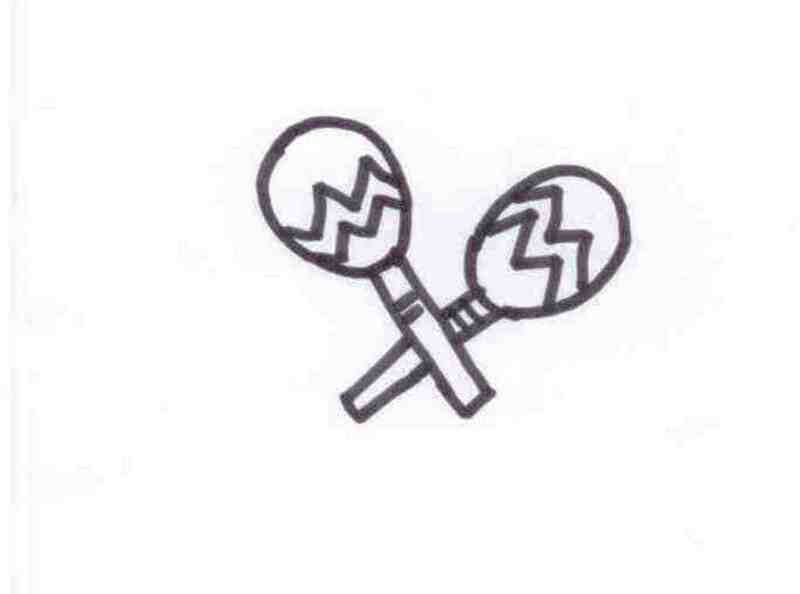 Seriously, though, that’s a pretty good drawing of the maracas. Good luck to the O’s the rest of the way, still plenty of ball to be played.